Photograph by Peter Fitzgerald, 2008 June 2. Courtesy Wikimedia Commons (CC SA). With the reopening of Baltimore’s Washington Monument on July 4, Baltimore Heritage is pleased to start offering tours of the monument and surrounding historic squares beginning on Sunday July 19 and every third Sunday of the month through November. After extensive renovations, the 200-year-old monument looks great and visitors are again allowed inside. 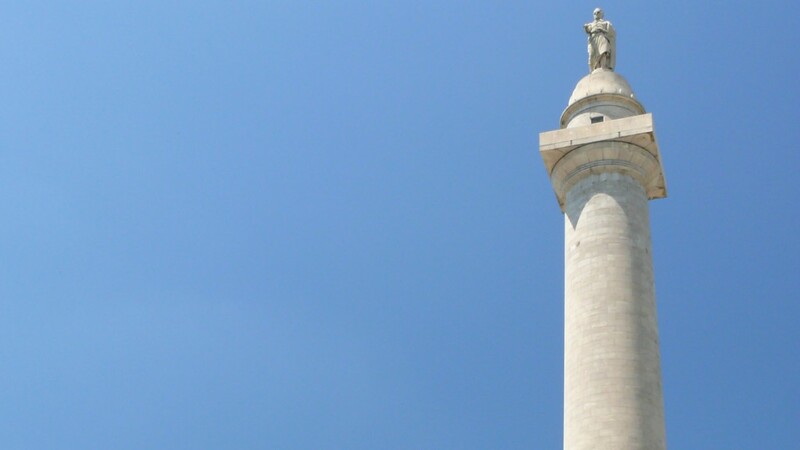 Join us and our partner, the Mount Vernon Place Conservancy, on a tour to hear the stories behind the monument and see some of the landmarks of Baltimore’s grandest historic neighborhood. If your legs are strong, climb the monument’s stairs for a birds-eye view of central Baltimore! Learn more and register today. We hope you can also join us on some of our other Sunday morning Monumental City Tours. Each tour in the series begins at 9:30 a.m. and lasts about an hour. I wanted so much to go on your Washington Monument tour, but it is full. Will you have another tour in August? September??? ?